Ever wondered how to make windsocks with the children quickly, easily and cheaply? Well, this windsock craft is so easy to do you’ll be ready to take it outside to play with in just minutes! 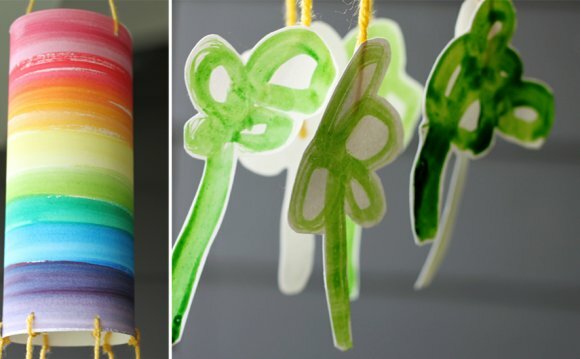 Another great thing about this rainbow windsock craft is that it’s made from an up-cycled plastic milk jug so you and the kiddies can have fun and be doing your bit for the environment at the same time. The milk jug base means the windsocks are perfect for little hands to hold on to easily and it’s like having handheld kites. We used rainbow ribbons for our windsocks because they’re so bright a cheerful and it’s coming up to St Patrick’s Day, but you could of course use any colours you like. Children will love running around and twirling seeing the kites’ rainbow tails trailing out behind them. These really are such colourful and fun windsocks to make and play with. Making a windsock is a great task for big kids to do independently and even if they’re too big to want to play with it themselves they can always make it for a younger friend or sibling or just hang it up outside as a garden ornament! My 10 year old made this one successfully without any help what-so-ever. Younger kiddies might need a bit of a helping hand in places. First he cut the bottom off the milk jug. He chose to saw through it with a bread knife and it worked really well. You could use a little hacksaw or even snip through with scissors. Then he measured out and cut off lots of lengths of ribbon. You can make these as long or short as you like. He chose an arm’s length as his guide. Finally he just stapled them on all the way around the edge. Hey presto your hand-held kite/windsock craft is finished! How easy was that? My youngest son has loved running around with it outside and it inspired lots of turning, spinning, leaping and dancing. Windsocks – What Are The Children Learning? Making windsocks is a super activity for older children to think through and problem solve how to achieve a finished piece. I told my son that I wanted to make a windsock using the milk jug and ribbons. I left it to him to work out how to cut the jug, measure out the number and lengths of ribbon and how to attach them. If you’re working alongside younger children then it’s a great activity for talking about colours. You can see a list of relevant colour learning ideas in my Rainbow Sensory Bottles post. Can the children decide how long they want their ribbon to be? Do they want the ribbons all the same length or different lengths? How can they measure the ribbon? Perhaps they’d like the ribbon as long as their arm or as long as Daddy’s foot? Older children might like to measure the ribbon out using centimetres. Can the children cut the ribbon? It’s a bit trickier than paper! How about a bit of Scientific Testing? What’s the best way to attach the ribbons? Glue, Sticky Tape, Masking Tape, or Staples? Perhaps they’d prefer to make holes and tie the ribbon on? Which method will last the longest and why? Which method will be best in the rain? Is there an optimum number of ribbons? Where is it best to attach the ribbons? Could the tails be made out of different materials? How about, paper or strips of plastic bag? I love crafts like this where there are lots of different ways of doing it. There is no right or wrong.